PAOK owner Ivan Savvidis invaded the pitch with a gun in a holster around his waist. Greece's sports minister says Greek Super League matches have been suspended indefinitely, a day after the gun-toting owner of PAOK marched onto the pitch following a disputed goal at the end of a league match. Minister Giorgos Vasileiadis, speaking after meeting Monday with the Prime Minister Alexis Tsipras, said fixtures have been suspended and would not restart "if there is not a new, clear framework agreed to by all so we can move forward with conditions and regulations." PAOK owner Ivan Savvidis walked onto the pitch at the Toumba Stadium on Sunday to dispute a disallowed goal in a game against AEK Athens. He was accompanied by bodyguards and appeared to be carrying a pistol in a holster around his waist. The match was eventually abandoned after Fernando Varela's disputed 90th-minute goal, which would have put PAOK ahead 1-0. 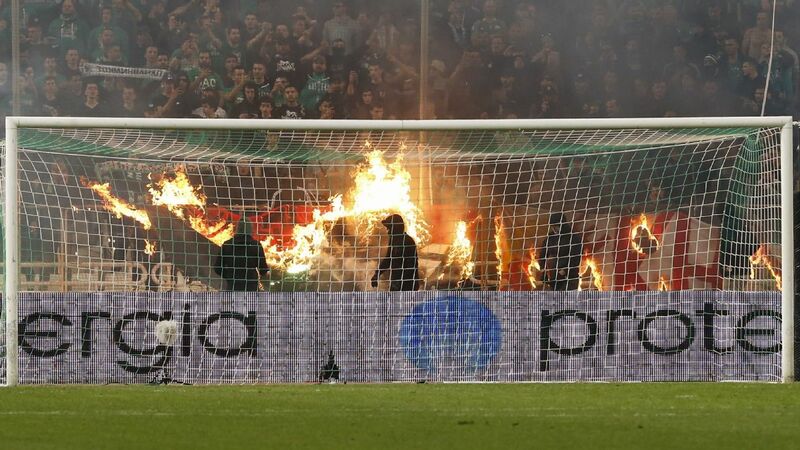 Meanwhile, Greek police say they are investigating Savvidis, who holds a gun licence, and four others for illegal entry onto the field and for possession of an object that could cause harm in a sporting venue. PAOK released a statement after the game, insisting that Savvidis invaded the pitch to "protect the club." "After what happened today in Toumba Stadium, PAOK FC president Ivan Savvidis is preparing to take all necessary steps to protect the club and all his executives and associates from the threats and attacks they are suffering," the statement said. AEK officials claimed Savvidis threatened the referee during his first of two forays onto the pitch before being pulled away. "We suddenly saw a man on the pitch with bodyguards and everyone started saying it was the PAOK president and he went first to the referee and then to our bench and started threatening everyone," AEK Athens coach Manolo Jimenez told Radio Marca. "We didn't fear for our lives initially but then, when I saw the photographs of the gun, you think to yourself, 'What if he [did] something crazy and pulls it out?'" ESPN FC Spain correspondent Adriana Garcia contributed to this report.